Every year, before the first freeze, the ritual of irrigation “blow out” becomes the priority for all irrigation systems in regions located where the frost level extends below the depth of installed piping. Even if you have drained the water out of your irrigation system, some water remains and can freeze and crack the PVC piping. Although polyethylene pipe is more flexible and can expand under pressure, water left inside can freeze and rupture the pipe walls. Freezing water in the backflow assembly will damage the internal components and can crack the brass body. To minimize the risk of freeze damage, you’ll need to winterize your irrigation system. In areas where winterization is mandatory, irrigation systems are installed using one of three types of water removal: manual drain, auto drain, or blowout. If you don’t know your system type, it is best to use the blowout method. Are patchy yellow spots popping up all over your lawn? Reviving burn spots on your grass is not easy, but it helps to know what is causing them in the first place. There are a number of reasons for brown or bare areas of patchy grass. If you suspect insect damage, fungus, or mold, be sure to treat for that first, otherwise you will be fighting a losing battle. When lawns are experiencing strong sunlight and getting little water, it is very common for them to burn. 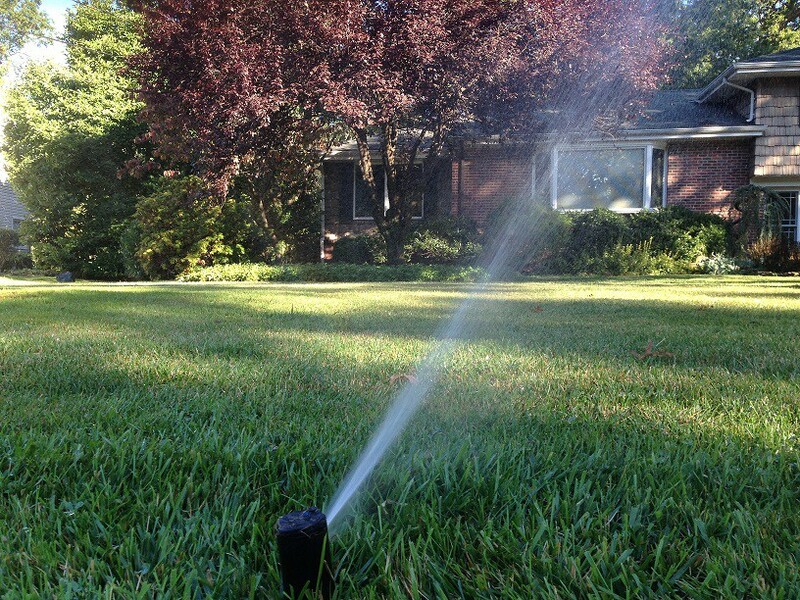 If you are experiencing a drought, make sure to water your lawn regularly to avoid this damage. Burning commonly happens in the summertime, so be weary! You can burn your lawn if you use too much fertilizer. Over-using fertilizer kills the microbes that keep the grass healthy and growing. Refrain from using fertilizers in the summer because the grass could burn or turn brown. Burned patches of grass can also come from dog urine. Dog urine has a high concentration of nitrogen, so it has similar burning effects to over-fertilization. If you have a female dog or a large dog, the patches are likely to be bigger because females urinate in one spot, and large dogs produce more urine. If too much sun and too little water are your problems, the only real solution is consistent watering. This is the most important thing to pay attention to when trying to maintain a healthy, burn-free lawn. Set up some sprinklers in your backyard to hydrate your grass and bring it back to life. Make sure the water is spreading evenly! If a good rainstorm comes along, don’t assume that your grass will be cured. It still needs constant watering after the storm is over! If your grass is burned from over-fertilizing it,you will need to find a balance of how much fertilizer to use. This will reduce the stress on your lawn. Check the back of your fertilizer bag for more details. You do not want to under-fertilize your lawn, but over-fertilizing will lead to more burning! The best kind of fertilizer to use in this situation is compost! You can buy compost or you can make it yourself (as our last article explained!). If your dog is the problem, perhaps give them more water. The more water they drink, the more diluted their urine will be. When their urine is diluted it is less potent, and less likely to burn your grass. Unfortunately, if none of these things work, then the burn damage is too much to repair. The next step would be to either re-sod or re-seed. This is the last resort, but it will fix your burn spot! Some may assume spring is the ideal time to seed their lawn. The temperature is warming, landscapes are in bloom — nature is coming to life once again. However, in our neck of the woods, we typically get a lot of rain during this time of year — much more than is required by newly planted grass making it difficult for it to flourish let alone survive. If rain isn’t an issue, temperature is. The cooler soil temperatures of spring slow the grasses growth and further injure tender new plantings. The best time for lawn seeding is from late August to mid September. Unfortunately, most people don’t think about seeding their lawns in the fall after drought and damaged areas have been created throughout the summer. Instead, most people think about lawn seeding in the spring, which is not an effective time to get consistent results. When the life of a lawn is looked at in the long term, the expense and effort of seeding is well worth it. The only downside to seeding is that it requires watering once to twice a day to ensure proper germination. In the end, your property value will increase, and seeing the new lush green turf on your lawn will be a pleasurable and worthwhile experience. The time of year is another important consideration when you plant a tree or shrub. Spring, summer and fall can all be appropriate planting times, as long as you take into account the impact of each season on plant growth. In many parts of the country, the cool weather, high humidity, and abundant rainfall of spring make this a particularly good time to plant. In summer, warmer temperatures promote growth but also increase a plant’s demand for water, so if you decide to plant at this time, choose a plant that has been well watered at the garden center, and irrigate it as needed after planting. Fall planting also has advantages – cooler air temperatures reduce the demand for water while the lingering warmth of the soil encourages rapid root growth. Take care, however, to allow your transplant enough time to become established before winter sets in. Young shrubs and trees do better when competition is kept in check, and mulch is the best way to supply the relief they need. Mulch suppresses weeds, conserves moisture, checks erosion, prevents soil compaction in heavy rains and moderates soil temperature. Pine bark, aged woodchips, pine straw, chopped leaves – most organic materials, in fact – work as well as mulch. All plants need soil with adequate moisture, especially while their root systems are growing rapidly. Water is the necessary ingredient for plant growth that is most often in short supply. If rain falls short, make up the deficit by watering deeply every five to seven days, taking care not to suffocate roots by over watering. The key to watering trees and shrubs is to water them slowly and allow the water to soak deep into the soil with no runoff. You can’t really do that standing there with a hose in your hand. I recommend drip irrigation systems whenever possible. They conserve moisture, while minimizing the liability of over watering. Since you don’t wet the foliage, you don’t encourage leaf diseases. The key to using drip irrigation is to water thoroughly, then allow the soil to dry moderately before watering again. As mentioned above, placing mulch over the drip system helps slow evaporation of moisture from the soil.